Over the last few months, I have upgraded components in our home to devices which feature IoT and home automation capabilities. The first thing I replaced was my thermostat. I considered several options and went with the Ecobee thermostat. A key consideration was integration with Amazon Echo and Apple Homekit. I am actually more aligned to Google than I am Apple, but at the same time, I am not interested in a total lock-in on any platform. 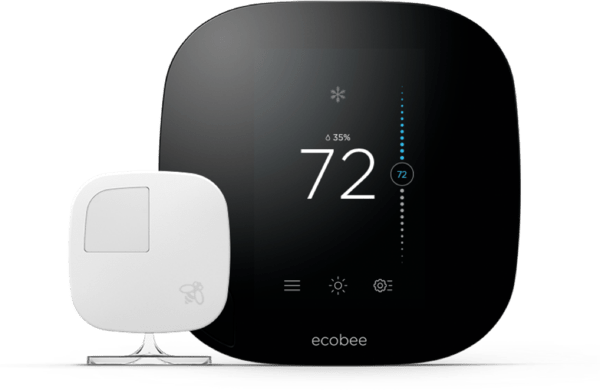 The Ecobee provides the right balance of independence, functionality, and UX. Also worth highlighting is that the Ecobee includes a second remote sensor, which is desirable in a mult-level house. Installation was easy, as was the setup. They really have made this as easy as possible providing you have the correct wiring configuration (4 wire, in my case). The app is well designed and easy to use. Bonus points for having a smartphone and tablet version of the app! Functionally, the thermostat delivers reliable performance on the schedule I set. I would like more options for automatically suspending the schedule when we are gone for long absences but I don’t want that feature if it comes with the risk of disrupting the schedule when we are in the house (I’m looking at you Nest). 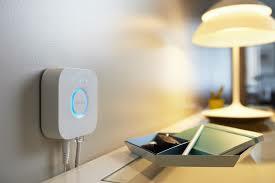 This next system is not IoT but the rest of the house depends on it, the wireless network. I replace the Asus gigabit extreme routers with an Eero mesh network. Range and speed is impressive and better still the single SSID to cover all of the access points both 2.4 and 5 GHz spectrums. Managing the network through the app is a breeze and better yet, I can do it from anywhere I am. It does not require me to be on the network to manage it. The best feature, by far, is the ability to set up family profiles and turn off/on the Internet when my children are being disruptive. It really gets their attention. Lighting was the obvious next choice. Philips offers the Hue line of smart lighting that they promote aggressively and I am a sucker for good marketing. I was interested in two aspects of the smart lighting experience, the quality of the light and the control experience. The system is easy to set up but the control pod does require a wired connection. Fortunately, one of the Eero access points is in a room adjacent to where I wanted to use the smart lights. My use case was not uncommon, a hallway that connects multiple rooms in the house and has morning and evening traffic. My kids use it and regularly forget to turn off the lights and when we leave the house I like to leave these lights on. The Hue lighting app is well designed and gives me a lot of control over not just the lighting configuration and on/off/dimming, but also setting a schedule (scenes and routines). I have the lights on a schedule for morning and night in addition to the typical turning on/off as needed. The Amazon Echo integration works fine but is confusing to setup because the Alexa home automation configuration inherits naming from the Hue controller and then superimposes it’s own naming. If you don’t have these things in sync, as in named identically, things can get hairball pretty quickly. I enjoyed the geek factor of “Alexa, entry lights on” for about 20 minutes… then it became annoying. This is the problem with voice control for those things that are normally analog, it is neither time nor effort efficient. Using the app to manage the lighting functionality is really inefficient and awkward, not to mention impractical in light of the fact that many people, of different ages, live in our house. Another aspect of the Hue smart lighting that I did not anticipate is that in order for the lights to work via the app and controller, the light switches need to be in the on position as a normal state. This works fine until someone reflexively hits the wall switch to turn off the lights. For new construction where you could install lighting to be hardwired for “on” and activated through a connected app but that will bring its own challenges. For outdoor lighting or fixed lighting that is used for accent or security functions, the Hue lighting makes a lot of sense. For the regular lighting that is used in a functional manner in the typical house, it just doesn’t work well. Rating: C. For specific use cases, e.g. landscape, this makes sense, otherwise I would recommend you pass. We recently renovated a bathroom in our house and in the floor we installed the Nuheat floor warming system with the Signature wifi-enabled thermostat. The Nuheat system is great, this is the third one we have installed in this house. 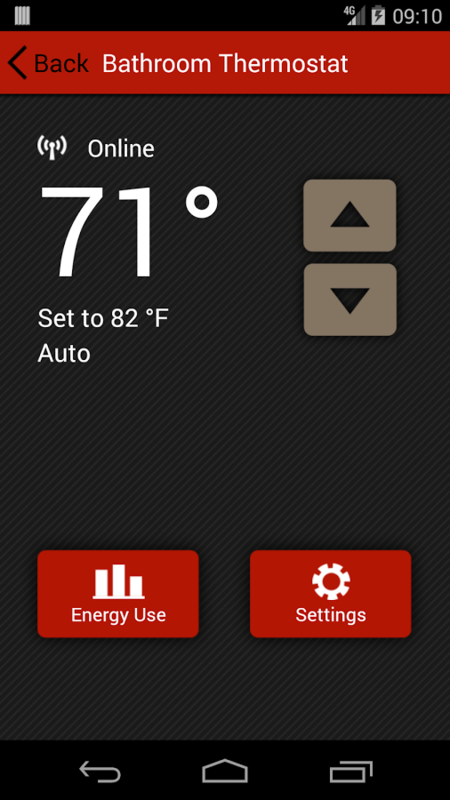 The Signature thermostat is easy to setup, connecting to Nuheat’s cloud service where config details are stored and synced between the app and system. I am not certain if this is the completely correct but it did require me to setup an online account in order to sync. The Nuheat app is great for programming the thermostat but in terms of actively managing the system, it does not offer much functionality. The energy consumption feature is nonsensical, it just tells you when the system is on, per the schedule, instead of how much energy you are actually consuming. Another missed opportunity was putting a motion sensor in the floor thermostat and using it to suspend the schedule upon prolonged periods of no activity. Rating: C. Nice functionality for programming the schedule but a good UI should accomplish that without requiring an app. Finally, word about Apple Home. It doesn’t do much… 4 words. Whatever value of Home is provided by having all Home-enabled smart accessories in one dashboard is negated by the cumbersome methods for managing said accessories. Actually, that is not totally fair, the Hue lighting controls are easier to use in Home than in the Hue app but scenes and schedule are not available through the Home app. It’s been a mixed bag and I am not exactly certain how I will proceed but when our laundry dryer failed a few weeks ago I considered a smart appliance but decided I really didn’t see any value in having laundry equipment connected to wifi. I purchased the Electrolux washer and dryer with enhanced control panel and no Wifi connectivity. Another device I didn’t want to connect to an integrated home automation hub is our security system so, for the time being, I have that partitioned off on its own network. We are still in the early days of home automation and manufacturers will need to figure out the right balance of convenience and function. One thing is very clear, not all IoT is the same, some providers view the app as an extension of the device while others treat the device and app as the same system. It’s worth experimenting with home automation to find those appliances that strike the right balance for you, which also gives you a strong perspective from which to evaluate future devices.